* Meter connects with 2, 5, 10, 20, 50, 100, 400 bar sensor, no calibration procedures are necessary when change a new sensor. 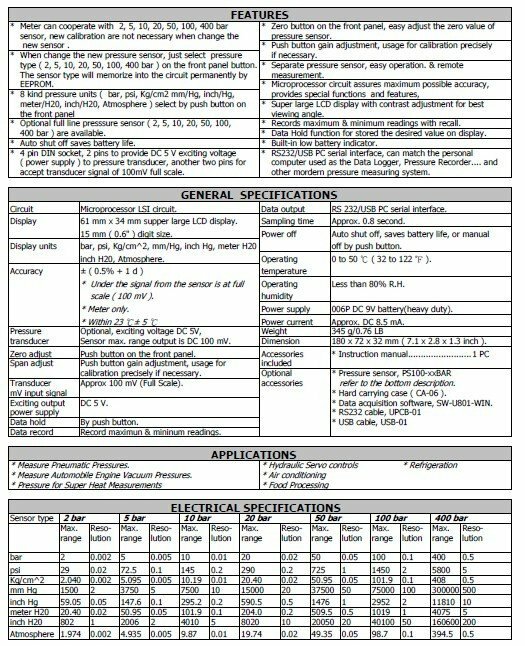 * Bar, PSI, Kg/cm2, inch/Hg, mm/Hg, inch/H20, meter/H2O, Atmosphere. * Data hold, Memory (Max., Min. ), RS232. Pressure Port Connector : PS 1/4", 19 teeth per inch. 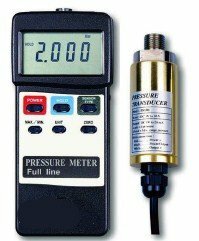 *Transducer can be used for water and air pressure.